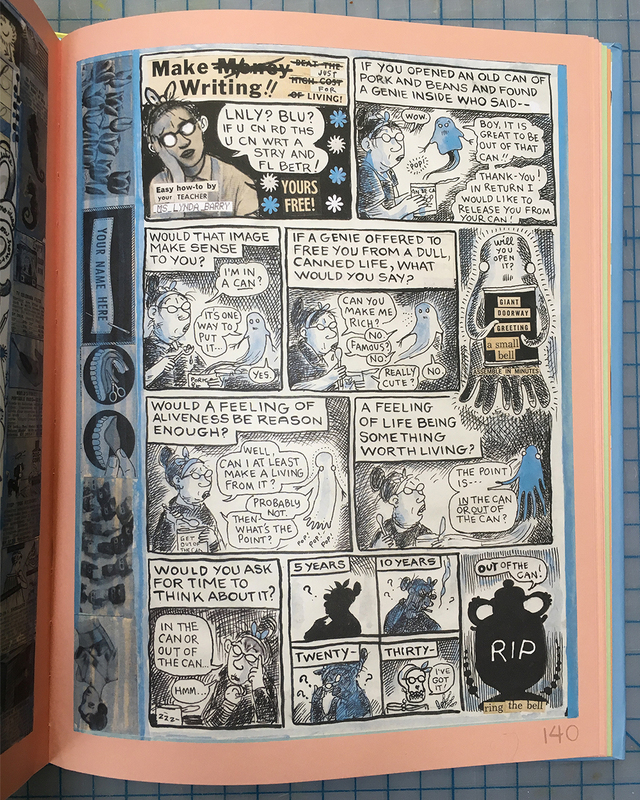 Today I wanted to talking about a cool book I read by the amazing cartoonist, writer and teacher, Lynda Barry. Its called : What It Is; Don’t you wish you could write? I know what you’re thinking: this is a photo blog not a writing blog. But bear with me…this book was transformative for me and I want to share with you why. We all have goals and mine is to become a better writer. Ok, thats not exactly true, what I really want is to write my own, original stories. But I’m scared; scared of failure which makes it hard to get started. Goals are great to have, but not if you don’t take that first step. Last fall I came across Ms Barry’s book and the companion book Picture This: The near-sighted monkey book, and I was immediately intrigued. Somewhere in the back of my brain I had heard of Ms Barry’s excellent writing courses she taught in Florida. I was intrigued how a famous visual artist becomes a well renowned writer. So I bought both books and they promptly started gathering dust on my book shelf. Until recently the books were better door stops than inspiration. What It Is, is 1/3 memoir, 1/3 pep talk and 1/3 creative exercises. Each page is a dense and chaotic mix of words and hand drawn images. You feel like you’re trespassing on a private journal, not a book designed to help you begin writing. While the book is an easy read, there are so many wonderful ideas filling each page, it pays to slow down and explore every piece of text. When I came across the page pictured below, I knew I was in the right place. There are people who are in the toy photography community who look at toys as only bits of plastic. I am not one of those people. There is a reason that the latest LEGO CMF”s are rarely seen in my photos. I haven’t connected with them. They are not my friends (yet) because friendships take time to develop. I enjoy photographing my friends having fun. Because when Im honest with myself, my toy imagery is simply my inner life on display for all to see. In the words of Lynda Barry: my toys are outfits for inner space creatures. “The same toy is not the same for anybody else.” Does this statement ring true for you too? When I read this page for the first time I was so excited! Can it really be this easy to find meaning from a creative pursuit? I now realize that we do what we do because it makes us feel alive. Being creative brings meaning to our lives in the most unexpected ways. Sure our kids, family and friends and other personal connections bring meaning to our lives. But a creative activity is special. It helps to give our lives a special focus and even joy. It’s been along time since I felt this good about what I’m creating. I know who may audience is and I know the images that I want to make. Now I simply need to continue carving out the time for more writing practice as well as staying open to receiving the images that are floating around me. If you’re interested in becoming a writer or are feeling stuck creatively I highly recommend this book. It’s very accessible and a lot of fun! All the hard won wisdom learned from a life time of being a painter, cartoonist, writer, illustrator, playwright, editor, commentator and teacher is freely shared with anyone who is interested in listening. This is the kind of book you can either read on a lazy Saturday afternoon. Or open to a random page to discover some amazing bit of information you either forgot or missed the first time. Like all truly great gifts, this one keeps on giving the more you read and open up to the process. It turns out inspiration can come from the most unexpected places. I’m sure you’ve told me before – but where does your inspiration come from? Do you find your images or do you let them come to you? Do you have a favorite story you draw from or do you dig deep into your childhood? 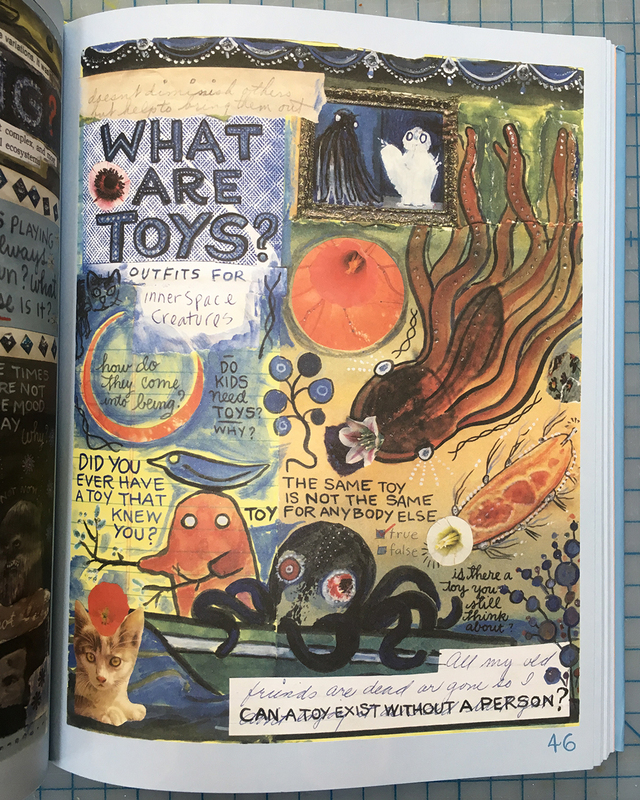 I love the picture from the book about “What a toy is” so inspiring. It made me think of my own project – toys and adults. There is something with the toys that we loved and cherish as children … I wonder if miss that “love” sometimes when we focus on all the amazing toys that we can buy and photograph. I have to think more about the love side of the toys we had as children – and what the aspect plays fro role in my creative life. Yes creating, reflecting is a way to come to life, to see yourself in a different light. I could agree with you more. to dive inside is hard, to share what you find can be even harder, it take time and curage to do both. I’m sad to hear you lost or missplaced your stuffed first toy. I think we cherrish the feeling of beeing safe, having comfort and company in a world so big and out of any childs control. I’m waiting for you to be part of my series – you can bring one of your childrens toys. I completely and totally agree that we’re all writers, we just chose what medium in which to share our writing. I am a big fan of the idea of images, at least the images I create, telling a story. Might be a small one, might only be one word, but its a story nonetheless, and stories need to be told. When it comes to inspiration, I honestly have no idea. Things just pop into my head at random times. Sometimes I think I have a handle on that, others I don’t. I do have some exercises I use to spark ideas when I need them, but what actually triggers the idea that pops into my head of a random thing while I am (for example) biking to work, I have no idea. The brain is an enigma. However when it comes to toys, for the most part, collect the ones that speak to me on some level. I feel a kinship with that character, so I collect the figure to create images so I can speak my own mind thru that character. When I look at the characters I use the most – Deadpool, Hulk, Iron Man, I see a lot of things in those characters – not their experiences, but their personalities and reactions, that resonate with me. I feel like I understand them on a deeper level than some others. Sometimes it is surprising. For example I don’t really like Hulk very much (tho his Ragnarok version was pretty entertaining), but I tend to gravitate towards shooting him. I think its cause those characters are all mentally troubled in some way (Hulk/Banner have two personalities, Iron Man has PTSD, Deadpool is, well, Deadpool). I am also mentally split right now. I went thru some nasty stuff with my brain, and I’m coming to terms with it, just like those characters have. If we all shared the same universe we’d likely end up in the same support group. So yeah, I dunno where inspiration comes from, but the way I chose to express it definitely comes from familiarity. Dave it seems like you know exactly where your inspiration comes from. It seems like you just laid it all out there for me: your images come to you when you aren’t thinking about them, you are inspired by certain toys because they reflect specific aspects of your own journey. You tell stories that are important to you, no matter how long or short. I think writers have been using poems to tell stories as well as the long novel. Not every story image needs to be a six image narrative. Im so glad you’ve found a method that works for you. Those connections with your muses are very important, guard them well! My inspiration has been very fickle lately… I suspect it’s because I feel so unfocused. But I agree with you about our creativity making us feel alive. I’ve been saying something similar to my hubby in the last few months, when I haven’t had much time for photos. I feel so dull and lifeless when I don’t have time to play with my minifigs and take pictures. 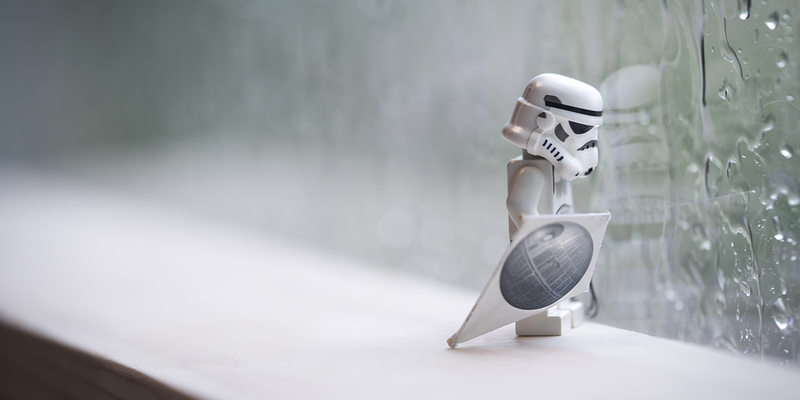 I love your photo of the Stormtrooper with the kite! 🙂 You caught that emotion of wanting to go outside and play, which is exactly how I’ll be feeling until summer is over. Lynn, I also connected with that line. Plus we see it everyday in action, with all the toy photos. Different photographers take different photos of the same toy, they are never the same! I hope you will be able to find time to take a photo or two. The act of creativity feeds the soul and will help you with your real life work. Please dont put it off until some better time; the time to act is now. The power to escape the box is in your own hands. Thanks for your kind word about the image. While I know stormtrooper images have been done to death, for some reason, this photo wanted to be taken. We shall see where this goes next week in Utah! Thank you Shelly! I ignored work and made time for photos yesterday and today 🙂 I’m much happier now! I love your post, your humor, your insight, and your vulnerability here. Personally, I may not need Lynda Barry because I’ve got Shelly Corbett. I really love how you push yourself to understand and create; it pushes the same for me and surely others. I find that not that many stories come to me. Toy photography is only a few years in for me and I’m not someone who has had many directly creative pursuits in life. I do find that when I bring my plastic friends, camera, and bag on a walk, I enter a more mindful, expressive, quiet, and fun place. And then photos sometimes happen. And sometimes I even like and post them. One of the things I love about most of the figs I shoot is that they aren’t from pop culture. I love that I don’t know their story, they don’t know mine, and we are creating new ones together. While Harry Potter characters, for instance, can be fun to shoot, I worry about a mismatch between their known identities and the way I relate with them. And then I shoot anyhow. Also, when I shoot, I sometimes of toy photos I love most, including yours and Kristina’s and those of others, too. 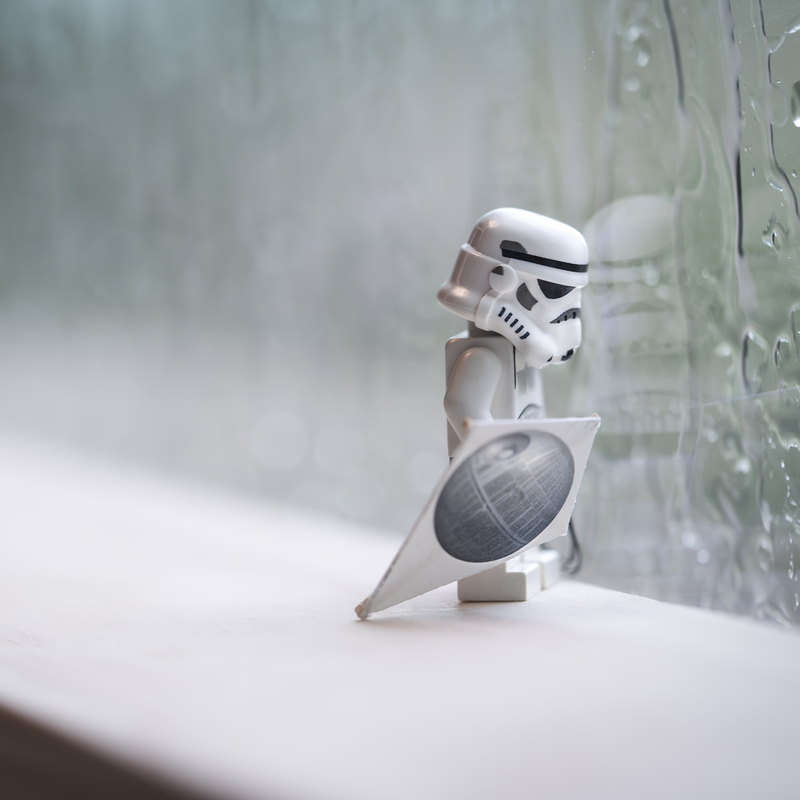 As is true with your Stormtrooper above, you capture such rich, vibrant, and unapologetic stories in each shot. Thank you for the inspiration. Doug thank you for your beautiful comment. And thanks for honoring my vulnerability. Sometimes I feel I lay it all out there and no one notices. I am an open book – warts and all! If toy photography is helping you be more present in the moment, then it has succeeded in being the best hobby ever. And just so you know, I feel the same way about the process. I look forward to photographing with you next week. We can take our toys out and create some new stories together! I say, “out of the can!” There’s something exciting about that line indeed. Thanks Shelly for sharing this book and your reflections. I always feel the greatest way to impart knowledge is via personal testimonies and stories such as yours here. Personally, I find it a joy to create a narrative with an image. Though I (try to) dabble with humor from time to time and experiment with action shots occasionally, my constant source of inspiration is still based on the desire to spread positivity through this art form. I’ve not done creative writing nor had much experience with other artistic expressions (.. other than dance in high school but let’s not go there. lol..) and I find toy photography just the perfect medium to create these ideas/messages. By the way, I really like that stormie image. It may be raining but I’m hanging onto the fun time to come when the sun comes back out. Great article Shelly – I’ll have to check out the books. I don’t have the words to describe where inspiration comes from but I don’t. All I can say is that I will suddenly have an idea and the next thing I know there are toys scattered around, especially minifigs. Oddly, some of my favorite photos have come when I get multiples of a figure in the blind bags. I’ll have to post some of my older shots so I can show you what I mean. Again, great article.